This dataset provides environmental, soil, and vegetation data collected in July and August 1997 from 85 study plots in willow shrub communities located along a north-south transect from the Brooks Range to Prudhoe Bay on the North Slope of Alaska. Data includes the baseline plot information for vegetation, soils, and site factors for the study plots subjectively located in three broad habitat types across the glaciated landscape. Specific attributes include: dominant vegetation species, cover, indices, and biomass pools; soil chemistry, physical characteristics, moisture, and organic matter. This product brings together for easy reference all the available information collected from the plots that has been used for the classification, mapping, and analysis of geobotanical factors in the region and across Alaska. This dataset includes three data files in *.csv format and one companion file. Figure 1: The low willow community Anemono-Salicetum richarsonii (subass. lupinetosum arctici) is widely distributed on upper terraces along the Sagavanirktok River (Schickhoff et al., 2002). Willow_Environmental_Data.csv Comprehensive set of environmental characterization data for the willow shrub transect plots including the descriptive site factors. Most measurement data have been processed to provide values at a common 10 cm depth. This measurement comparability facilitates analysis of geobotanical relationships across Alaska. Note: Coded and scalar variables are followed by a description column (e.g. SNOW_COVER and SNOW_COVER_DESC). 4 to 84 10428 to 10512 Column headings are all 85 plot numbers. The data values are Species Cover Classes (Braun-Blanquet cover-abundance scale): where r (rare), + (common, but less than 1 percent cover), 1 (1-5 percent), 2 (6 to 25 percent), 3 (25 to 50 percent), 4 (51 to 75 percent), 5 (76 to 100 percent). Willow_Veg_Plot_photos.pdf This file contains landscape photos of willow vegetation from Shickhoff et al., 2002. These data bring together for easy reference all of the available information collected from the plots that has been used for the classification, mapping, and analysis of the geo-botanical factors from plots on the willow transect along the Dalton Highway in northern Alaska. Derived regional maps of these data will be used in regional models of fluxes of trace gases, water, and energy from tundra surfaces. In addition, a circumpolar vegetation classification resulting from these datasets would be highly desirable to extend the results to the entire arctic region. The eighty-five study plots are located along a N-S transect from the southern slope of the Brooks Range to the Arctic coast in the vicinity of Prudhoe Bay/Deadhorse. The transect follows the northern segment of the Dalton Highway. Plot locations are depicted in Figure 2. The major portion of the transect lies within the drainage system of the Sagavanirktok River on the North Slope of Alaska. 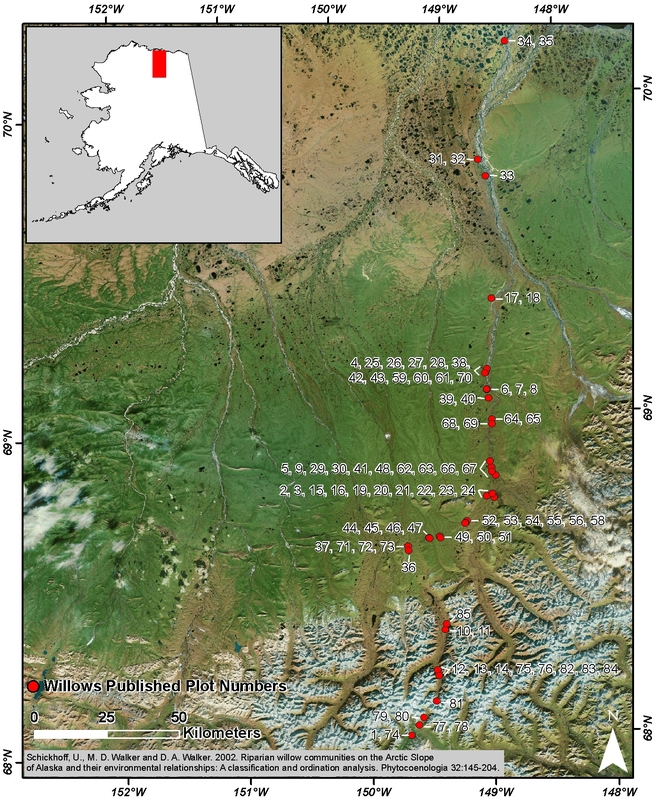 The plots were subjectively located in three broad habitat types including: tall willow shrub communities on floodplains, gravel bars, and lower terraces as well as on upland montane stream banks (27 plots); open low willow shrub communities on the banks of upland tundra streams as well as upper terraces from about 950 m in elevation down to the coastal plain (35 plots); and low willow shrub communities restricted to the most humid and acidic banks of upland tundra streams in the Arctic foothills, roughly between 400 and 800 m in elevation (23 plots). The study sites were selected along rivers and streams of different orders in order to cover the full variety of riparian shrubland habitats between the Brooks Range and the coastal plain. The plots were sampled according to the Braun-Blanquet approach. Phytosociological and environmental data collection was conducted between July 9 and August 17 1997. Sample plots were of square or rectangular shape. Representative samples of the Salix-communities required minimal areas between 50 m2 (low shrublands) and 100 m2 (tall shrublands). Shrub, field, moss and lichen coverage were measured or estimated for each of the sample plots. Species cover was estimated according to the traditional Braun-Blanquet cover-abundance scale. Estimates of a number of habitat factors, such as frequency of flooding, soil moisture, site moisture, snow cover, percent cryoturbation, and animal disturbance were recorded. Additionally, the vertical distance to the water table was measured, and information on the locality, on the entire size of the sample stand, on microtopography and geomorphic processes, and on the surrounding vegetation types was noted. 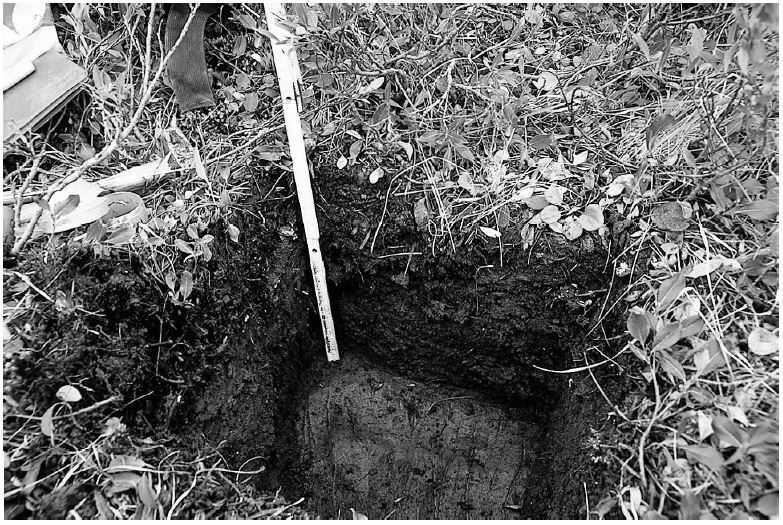 A soil pit was dug on each sample plot. Soil profiles were described according to Schlichting et al. (1995) with regard to active layer depth, thickness and type of horizons, color, texture, humus contents, moisture conditions, and root patterns. Soil samples were collected from 10 cm depth in each soil pit. Fresh field samples were oven-dried at 105 °C for 72 hours in camp to determine percentage weight loss and soil moisture. Laboratory soil analyses (Soil, Water and Plant Testing Laboratory, Colorado State University) comprised soil pH (saturated paste method), electrical conductivity, percent organic matter, NO3-N, plant available P, K, Zn, Fe, Mn, Cu, and percent gravel, sand, silt, and clay. Figure 3. Salix alaxensis-communities are not restricted to lowland river banks. 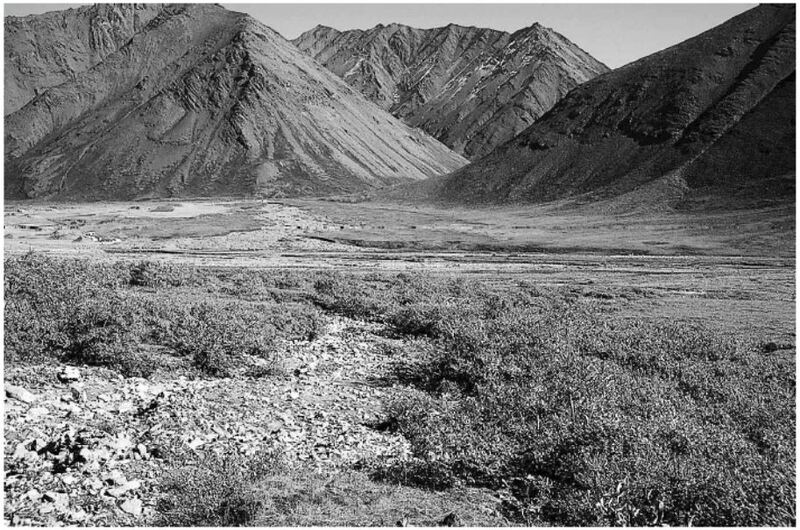 As true pioneer communities they occupy gravelly montane stream banks in the Brooks Range, which might show only periodical streamflow (subass. polemonietosum acutiflori). Stand productivity and vigor of Salix alaxensis is reduced (Schickhoff et al., 2002). Figure 4. Sites of Salix pulchra-stands are characterized by a very shallow active layer. Thick moss layers provide perfect insulation of the subsoil (Schickhoff et al., 2002). Schickhoff, U., M.D. Walker, and D.A. Walker. 2002. 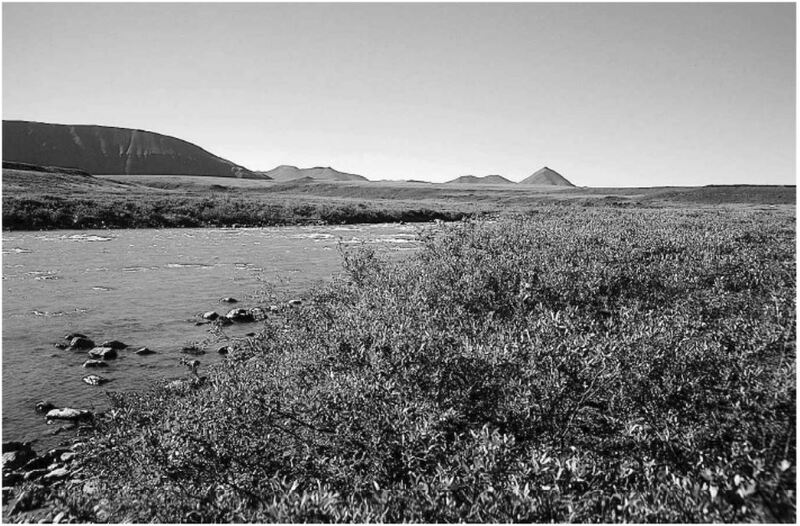 Riparian willow communities on the Arctic Slope of Alaska and their environmental relationships: A classification and ordination analysis. Phytocoenologia 32: 145-204. Schlichting, E., H.P. Blume, and K. Stahr. 1995. Bodenkundliches Praktikum. - 2. Aufl., Blackwell, Berlin - Wien.